"Can kids lift weights? My 11 year old son, who is very athletic, wants to begin lifting some free weights to help get more fit." While the American Academy of Pediatrics is against weight lifting, power lifting, and body building for kids "until they reach physical and skeletal maturity," they do approve of strength training programs for children and teens. Both weight lifting and power lifting are considered competitive sports that emphasize "maximum lifting ability" or lifting as much weight as you can. On the other hand, strength training involves "the use of resistance methods to increase one's ability to exert or resist force. The training may utilize free weights, the individual's own body weight, machines, and/or other resistance devices to attain this goal." The AAP also recommends that kids should be able to complete 8 to 15 repetitions in a set and remember that the goal is not lifting as much as you can. Instead, kids can slowly begin adding weight in small increments as they are able to easily finish their sets. These recommendations on weight lifting for kids aren't just from the AAP either. The American College of Sports Medicine also states that "Contrary to the traditional belief that strength training is dangerous for children or that it could lead to bone plate disturbances, the American College of Sports Medicine (ACSM) contends that strength training can be a safe and effective activity for this age group, provided that the programs properly designed and competently supervised. It must be emphasized, however, that strength training is a specialized form of physical conditioning distinct from the competitive sports of weightlifting and powerlifting, in which individuals attempt to lift maximal amounts of weight in competition. Strength training refers to a systematic program of exercises designed to increase an individual's ability to exert or resist force." The ACSM suggests that "one to three sets of six to fifteen repetitions performed two to three times per week on nonconsecutive days have been found to be reasonable. Beginning with one set of several upper and lower body exercises that focus on the major muscle groups will allow room for progress to be made. The program can be made more challenging by gradually increasing the weight or the number of sets and repetitions." 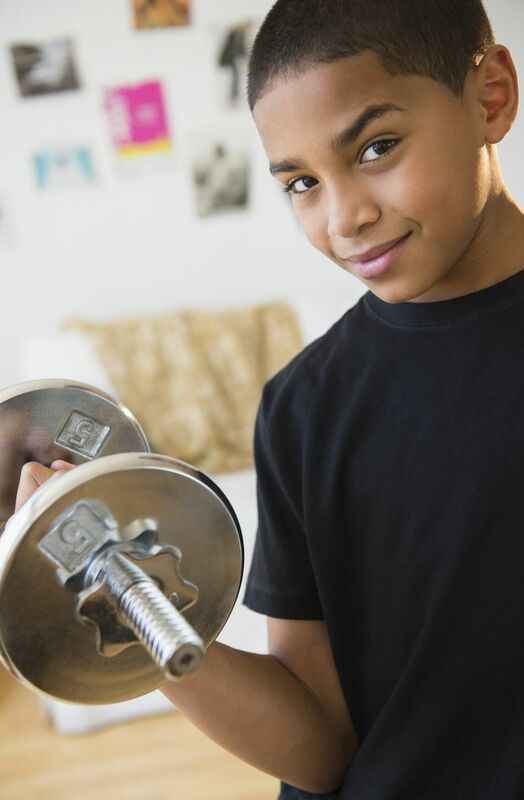 Most importantly, make sure your child is well supervised as he starts lifting weights, especially if he is doing it at home and won't be supervised by a trainer at school or a gym. Muscle strains are a common injury in kids who begin to lift weights and who aren't well supervised. So you likely shouldn't discourage your child from 'lifting some free weights,' as long as he does it properly. There are many benefits to strength training. Do talk to your kids who are interested in building up their muscles about protein supplements, which aren't needed, and about the dangers of using performance-enhancing substances and anabolic steroids. And consider getting a personal trainer that has experience with preteens and teens if your child needs any extra help. AAP Policy Statements. Committee on Sports Medicine and Fitness. Strength Training by Children and Adolescents. Pediatrics 2001 107: 1470-1472. Faigenbaum, Avery D., Ed.D. Youth Strength Training. American College of Sports Medicine. Sports Medicine Bulletin, Vol. 32, Number 2, p.28. Is Drinking Organic Milk a Healthier Option for Your Kids? What Do I Do When My Kids Are Sick?